The below Wall St Journal article appeared in The Australian on March 2, 2012. ROME—The Vatican is giving the public a rare, if temporary, peek inside its secret archive. 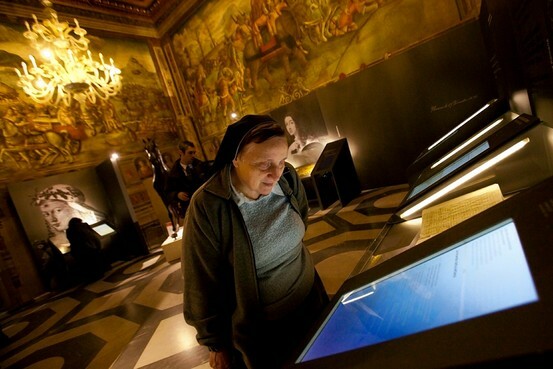 On Wednesday the Vatican kicked off a six-month exhibit at Rome's Capitoline Museum that will place 100 documents, usually locked away in the pope's personal archive, on display. A papal bull excommunicating Martin Luther from the Catholic Church; the judicial acts of the trial of Galileo Galilei; and a letter from the guillotine-bound Marie Antoinette, are just a few examples of the kind of history-in-the-making documents that rarely are seen by the general public. A register of the oaths of fealty to Pope Innocent VI is part of the exhibit. The exhibit is part of a Vatican effort to rebrand one of its controversial institutions. The Vatican Secret Archives—the official name of the papal archive—have long been a source and symbol of intrigue, providing endless fodder to conspiracy theorists and a useful backdrop to at least one Dan Brown novel. Critics have long accused the Vatican of using the archive to keep historically relevant—and potentially damaging—documents sealed away for ages. 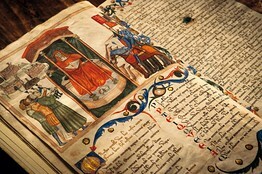 Despite the repository's reputation for secrecy, however, scholars are actually allowed to consult most of the archive. "We don't want this material to be kept secret," Vatican archivist Enrico Flaiani told a group of reporters this week as he guided them into an underground bunker that houses part of the archive. A visitor reads a document on Wednesday from the exhibit at Rome's Capitoline Museum. Beneath a vast concrete ceiling, curled parchment and cracked leather bindings filled the dimly lit stacks. Mr. Flaiani cast the archive as a mere victim of Latin lost in translation. The decision to call the Archivum Secretum Vaticanum the Vatican's "secret archive" was a mistake, the archivist said, adding that he preferred the translation "personal archive." Still, part of the archive is certainly kept secret. Documents dating from 1939—the year the World War II-era pontiff, Pius XII, took office—are kept locked behind metal fences. Vatican officials have said they need time to index the files, but the issue is one of papal prerogative. 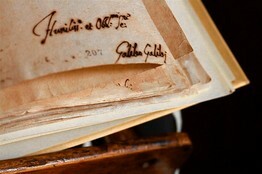 Documents related to the trial of Galileo Galilei are part of the exhibition. Pope Benedict XVI, or his successors, will decide when those documents are made public. For the exhibit, however, the Vatican appears to have allowed at least one such document to slip past the fences. Among the letters on display is an April 1944 memorandum from a Rome priest to Giovanni Battista Montini, a top Vatican bishop who would later become Pope Paul VI. A week earlier, Nazi troops had massacred hundreds of people near catacombs on the outskirts of Rome and had tried to cover up the act by sealing the bodies inside a quarry. "There is a pile of corpses. Six can be seen clearly," the memo states, describing one of the younger victims as having "three fingers whose flesh has been stripped off in earlier torture." "Another has dug his nails in the chest of his comrade who has fallen beneath him, as if he was trying to get up for the last time," the memo states. The archive has a tortured history. Bishop Sergio Pagano, head of the archive, recalled how in earlier centuries his predecessors were thrown in Vatican dungeons for releasing papal files. When Napoleon Bonaparte conquered Rome, he moved the entire archive to France. With his reign ended, thousands of documents were destroyed in a cull, because the archive was deemed too massive to return to Rome in its entirety.